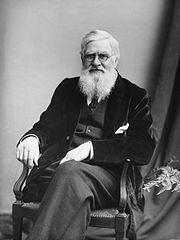 For the centenary of Alfred Russel Wallace’s death, November 7, 2013, I assembled a host of on-line resources about Wallace’s life and work, which was posted to ncse.com and sent in Evolution and Climate Education Update, NCSE’s free weekly e-newsletter. (Not a subscriber? That’s easy to fix.) After he received the update, Norman Sleep, a professor of geophysics at Stanford University, sent me Kevin Zahnle’s 2001 article (subscription required) from Nature about Percival Lowell’s ideas about canals on the planet Mars. Although Lowell didn’t discover the canals—that credit belongs to Giovanni Schiaparelli—he was responsible not only for popularizing them but also for promoting the idea that they were the products of intelligent design. Lowell’s views were dotty; Zahnle admits that “Lowell’s flamboyance, combativeness, and inflexibility made him look ever more like a crank” on the topic. But what’s the connection to Wallace? Well, in 1907, at the age of 83, Wallace wrote a book—entitled Is Mars Habitable?—responding to Lowell’s 1906 book Mars and its Canals. In his Man’s Place in the Universe (1903), Wallace had argued that Mars was not inhabitable, so he was understandably concerned to defend his position against Lowell’s. Zahnle writes, “Lowell’s arguments were generally much better than Wallace makes them out to be, which is why many survived substantially intact into the 1960s,” adding, “but Wallace identified three fatal flaws, two in physics, the third in interpretation.” It’s the interpretative flaw that interests me here. Zahnle writes, “Here Wallace answered the ‘Nothing I can think of apart from life can explain ...’ or the “I’ll know it when I see it’ arguments that still pervade the abstract business of life detection.” But since Is Mars Habitable? is freely available on-line, I decided to take a look for myself at what Wallace in fact argues. But last and all-embracing in its import is the system which the canals form. Instead of running at hap-hazard, the canals are interconnected in a most remarkable manner. They seek centres instead of avoiding them. The centres are linked thus perfectly one with another, an arrangement which could not result from centres, whether of explosion or otherwise, which were themselves discrete. Furthermore, the system covers the whole surface of the planet, dark areas and light ones alike, a world-wide distribution which exceeds the bounds of natural possibility. Any force which could act longitudinally on such a scale must be limited latitudinally in its action, as witness the belts of Jupiter and the spots upon the sun. Rotational, climatic, or other physical cause could not fail of zonal expression. Yet these lines are grandly indifferent to such competing influences. Finally, the system, after meshing the surface in its entirety, runs straight into the polar caps. It is, then, a system whose end and aim is the tapping of the snow-cap for the water there semi-annually let loose; then to distribute it over the planet’s face (p. 373). Anyone familiar with “intelligent design” creationism will be struck by Lowell’s reasoning here: a phenomenon is identified as in need of explanation; all possible natural explanations are dismissed; and intelligent design is triumphantly inferred. Now, Wallace’s main answer to Lowell involves providing a possible natural explanation that Lowell overlooked: “a physical model of fracturing of a cooling, originally hot lithosphere accreted around a primordial cold core,” as Zahnle summarizes it. But it’s interesting to note two features of Wallace’s discussion that indisputably put him at odds with today’s “intelligent design” creationists. First, Wallace (along with Lowell) clearly assumes that intelligent design entails adequate function: for example, he notes that the length of the channels make it implausible to suppose that they were constructed for irrigation—unless, he jokes, they were “the work of a body of madmen rather than of intelligent beings.” In contrast, “intelligent design” creationists insist that intelligent design doesn’t entail adequate function—while blithely helping themselves, of course, to the idea that adequate function entails intelligent design. Second, Wallace clearly assumes that the canal system’s supposed designers were ordinary physical agents, constrained by the same laws of physics that constrain civil engineers here on Earth. If Wallace had been reasoning like today’s “intelligent design” creationists, however, he would have been studiously neutral here, allowing that the canals might have been the product of a direct creative act of God—or, perhaps, Tur, the god of the Phundahlians on Edgar Rice Burroughs’s Barsoom—and thus would be in no position to counter Lowell’s design inference. The recent “intelligent design” creationist attempt to coopt Wallace as a precursor was never all that plausible, especially when Wallace authorities like George Beccaloni, Michael Shermer, and Charles H. Smith took pains to debunk it. But it was gratifying to see for myself how implausible it is. It’s too bad, really, that I didn’t give it any credence: otherwise I could thank Sleep for rousing me from my dogmatic slumber! UV Radiation and Skin Cancer: Too Soon to Tell?